As the holiday is coming up, have you started to think about decoration ideas for your home? In addition to putting up a real Christmas tree, we can fill Christmas spirit in our home or office with some creative handmade Christmas trees. Here is a nice DIY project to make a mini Christmas tree with chocolates and tinsel. It’s very easy to make. It will be a gorgeous centerpiece on your holiday table. It also makes a nice gift for family and friends. Just pick your favorite chocolates or candies and get started! Cut out a piece of cardboard, make a cone and secure it with glue. Wrap the base of the cone with one layer of tinsel and secure it with glue. Apply double sided tape around the cone. Attach chocolates to it as the second layer. 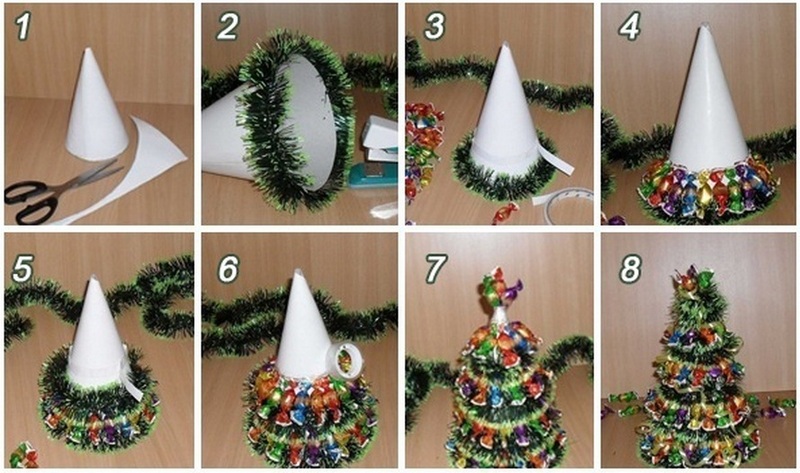 Repeat steps 2 to 4 all the way to the top of the cone until the entire cone is covered with tinsel and chocolates. You can decorate the top of the cone with a Christmas star ornament, or simply arrange the chocolates in a star shape. This mini Christmas tree is done. Enjoy! One Response to "DIY Mini Christmas Tree with Chocolates and Tinsel"